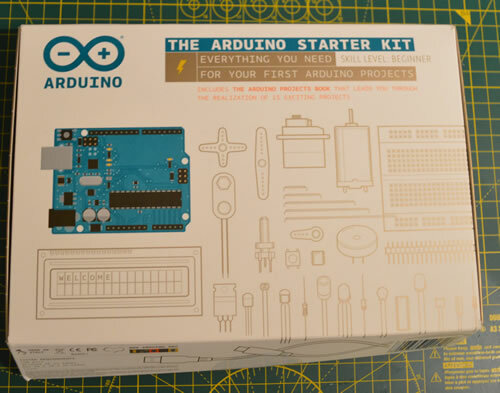 The Arduino/Genuino Starter kit includes all you need to start a basic Arduino project. The core of the kit is an Arduino Uno with the associated cable required to connect it to your computer. In addition to this, there are a number of components included that allow you to start learning the basics of electronics. This resolves one of the big issues of starting to work with electronics, knowing what to buy! By including a variety of useful components this kit gives you the flexibility to try different projects. Not to mention the range of components inside means you get experience with a good set standard electronic components. This kit also comes with a 160 page book with code and examples. This goes through the basics of installing the software to a variety of projects you can work on. This allows you to quickly and easily start using your Arduino kit. The starter book requires no pre-requisite knowledge and is useful for both beginners and those with a little more experience. Even with some knowledge of electronics its useful to introduce how the Arduino works and how to program and use it. This provides all the basic electronics required to make all projects in the book and experiment yourself. In the Arduino Projects book there are a number of projects which lead you through creating a variety of circuits. These go from the quite simple, turning LED’s on and off, to the more complex process of controlling an LCD panel. The first section of the book goes through a number electronics basics such as parallel vs series circuits, Ohms Law, and programming the Arduino. This works as a handy guide to practical electronics that will help for beginners and those more experienced who need a reference from time to time. Each project in the kit shows you what you need to use for the project. Then goes through how to assemble the circuit and finally the code required. All code is commented and details what is happening alongside to get you used to programming the Arduino. The first couple tutorials run you through the basics of the Arduino. The later tutorials cover much more complex circuits and software such as using the Processing language. Overall this Kit is very good value for money for the price of the Arduino, components and book. For someone wanting to learn electronics this is a very good product. The book is written well and includes lots of project ideas and code. Since the kit includes all the required electronic components you don’t need to buy anything else. Definitely recommended for someone starting out electronics. This can also be useful for someone who wants some project ideas and does not already have an Arduino.